Mallard bathroom furniture is manufactured by Be Modern, one of the leading manufacturers of bathroom furniture in the UK. Based in the North East of England, they began to make furniture in 1964 when fitted bathroom furniture was just taking off. Today, they are proud to be forging ahead with innovative ways to turn your bathroom into something stylish and luxurious. Their excellence in innovation, service and product quality has been constantly recognised by their customers and they are tried, tested and trusted by major organisations. Mallard's contemporary fitted and modular furniture collections consist of 4 stunning finishes that have been chosen by their experienced design team for their ability to suit a wide range of bathrooms. Their slab and shaker door styles are available in White gloss, Mali oak, Bardolino oak and now also their new finish, Silver elm. Fancy something a bit more traditional? Mallards range of classic door finishes have got you covered. These are available in white woodgrain, ivory woodgrain, cashmere woodgrain and stone grey woodgrain. They have drawn on over 50 years manufacturing experience to create Mallard. Built on three values; style, simplicity and security, Mallard offers unparalleled value to retailers, installers and homeowners alike. On Display we have the slab style Mali Oak doors. 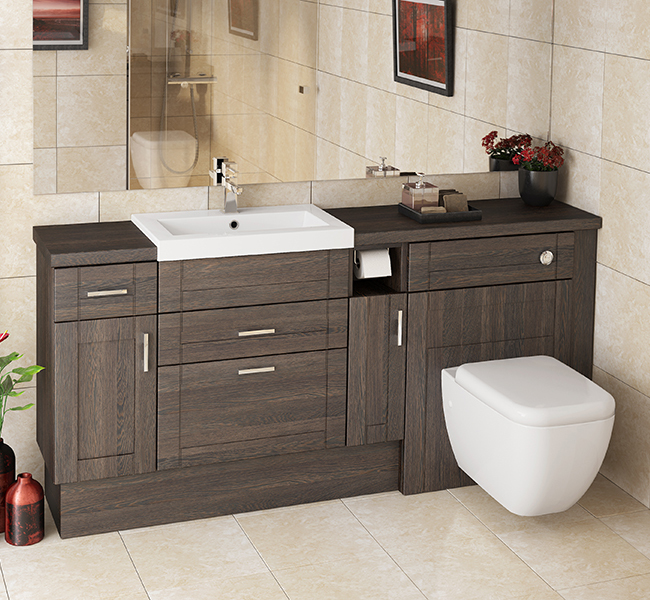 The deep, rich colouring and real wood grain texture of Mali Oak is simply beautiful; bringing luxury and opulence to all styles of bathroom, from modern to traditional. Mallard's stunning sit-on basins make full use of the cabinet depth and a wall hung toilet adds another dimension to the furniture. Simple, yet stylish handles and one of their beautiful chrome basin mixer taps such as the T10 shown here, completes the look perfectly. This range is also available in the following finishes finishes, White Gloss, Bardolino oak and Silver elm. MALLARD DOOR FINISH SAMPLES CAN BE FOUND ON DISPLAY IN OUR SHOWROOM.